Previous PostPluck DissectionNext PostPracticals off the menu? That fire is not too “wimpy” in the context of a lab with a 3 metre high ceiling (and some ceilings are even lower). A demonstrator in a large University lecture theatre might create a larger one (some are on You Tube and badly done). Risk assessments are not just about the chemicals but also about the room you work in. CLEAPSS had to produce guidance on this because teachers were being burnt spraying in water with wash bottle or using far too much oil. We are not being killjoys but basically trying keep teachers out of trouble and not being seriously hurt. For those of you who subscribe to CLEAPSS, the information is in Guide L195 at present but I suspect will be made into a supplementary risk assessment in due course. This is a very familiar demo, thanks to a thousand YouTube films. Many of those may be reckless, but they do set an expectation of what you’re going to see. 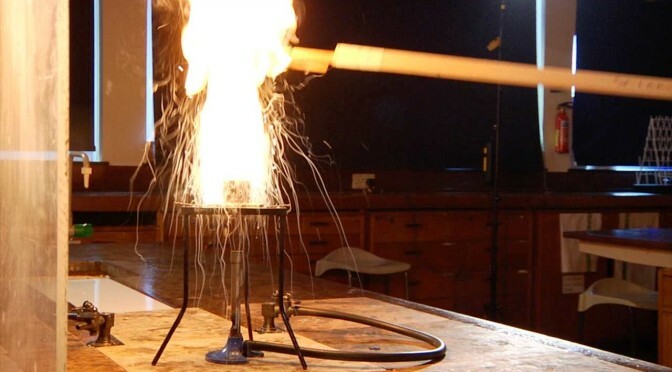 In practice, following the guidance, several of our attempts could reasonably be described: ‘the fire spat a bit, then went out.’ If the purpose of the demonstration is to impress upon students the dangers of oil fires, that’s a failed demonstration. One’s natural inclination is probably to use more oil – bzzzt! Nope, wrong. Don’t. But personally, I was left with the impression that this demonstration had been toned down beyond the point where it works theatrically. A safe demonstration isn’t always effective, which to my mind implies one shouldn’t perform it. I’ve taken some persuading that the chip pan fire demo doesn’t fall into this category. What we’ve learned subsequently is that it is possible to extract a satisfying performance from the recommended 3ml oil. On that basis I’m again happy to promote the demo to teachers for their consideration. Of course, this discussion is part of why we started this site. Delivering demonstrations is a careful balance between storytelling, emotional response, pedagogy, and not harming anyone. This is an interesting demo regarding safety, I think it almost becomes more dangerous if the effect is too small, because the size of the effect on the video is verging on looking fun rather than scary. Which could probably be more dangerous overall than slightly charring the ceiling. Exactly, Dave. Several of our takes were in that “Woah! Cool!” category rather than “Woah! Scary!” (inevitably followed by nervous laughter borne of relief). It’s the latter you want for the message to have impact, otherwise you’re just showcasing something that’s readily repeatable, only with less care. why not simply complete the demo by showing how you can put it out – the wet tea towel. (and you can explain the science of that too if you want). Then as well as knowing that pouring water is not the thing to do, you know what is. That might actually save a life. Averil: See my second note in the main story. We don’t talk about putting out the fire because the advice has changed (apparently some time ago, but it was news to me too). The success rate with a damp tea towel is apparently rather low and the casualty rate rather high, so the government advice now is to get out, stay out, and call 999. That sort of crisis-level fire safety really isn’t my area of expertise, and I’ll absolutely defer to the expert opinion.